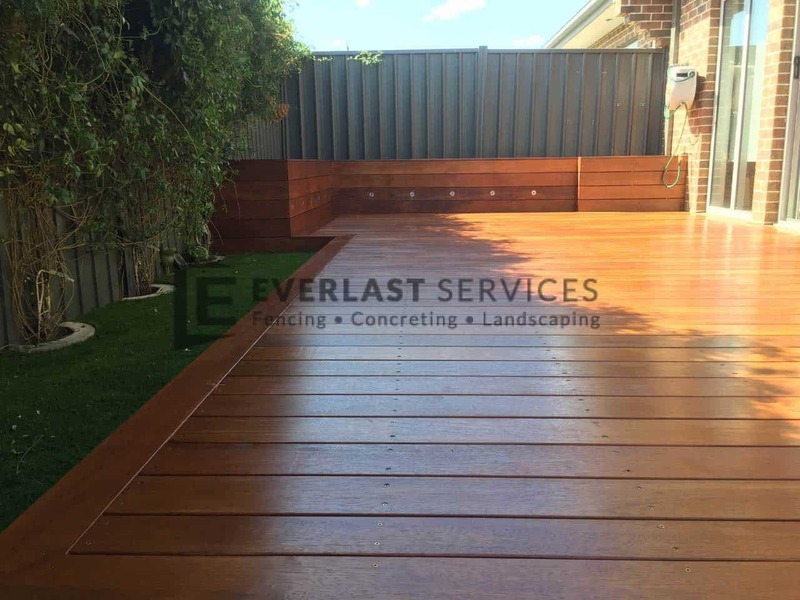 Located in Kingsville, this garden decking job required a high-degree of workmanship and attention to detail in order to give the customer exactly what they wanted. The completion of this project wouldn’t have been possible without the passion that Everlast Services brings to every job. 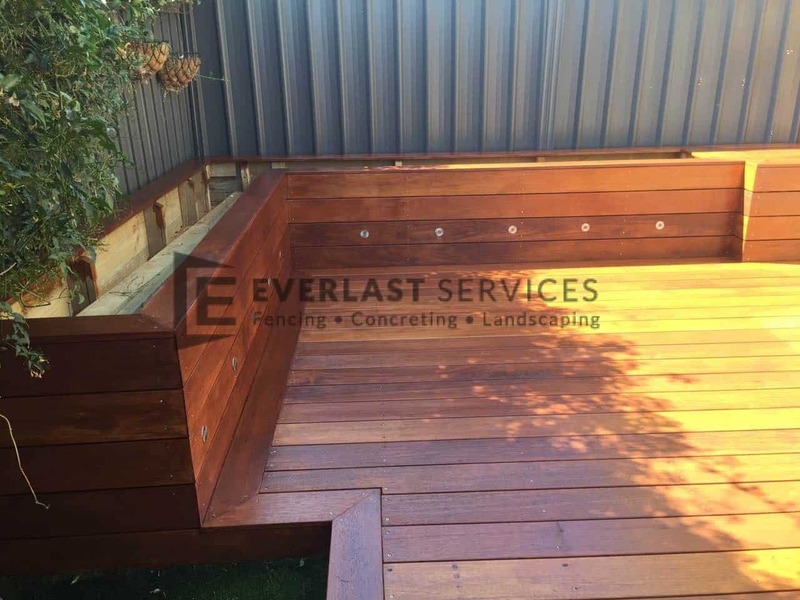 The customer wanted a custom decking solution for their backyard. As the photos above illustrate, we were required to supply a large decking solution with a number of intricate details. 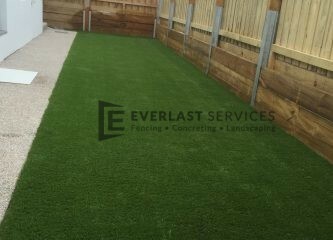 The customer had shopped around before coming to Everlast Services and found that other companies prices were far too high, or they weren’t prepared to finish the job to such a superior quality standard. 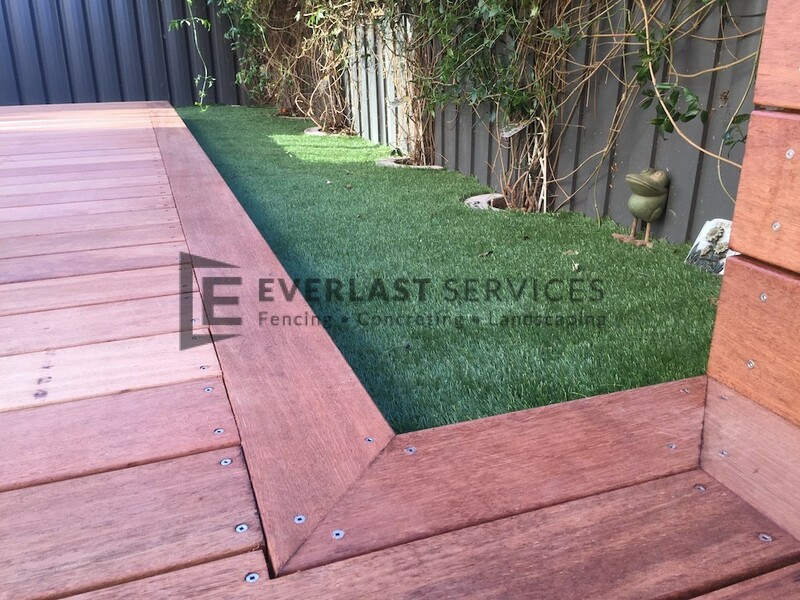 Everlast Services were not only gave the customers an amazing quote, we took care of all the little features that this particular garden decking solution required. Everlast Services carried out all of the lighting and electrical works that the deck needed, something which other companies weren’t prepared (or able) to do. Having licensed electricians on our team allowed us to perform the entire contract, giving the owners the benefit of a single point of contact, and a consistent approach throughout the duration of the project. Our master craftsmen were excited about the level of detail that the decking solution required. 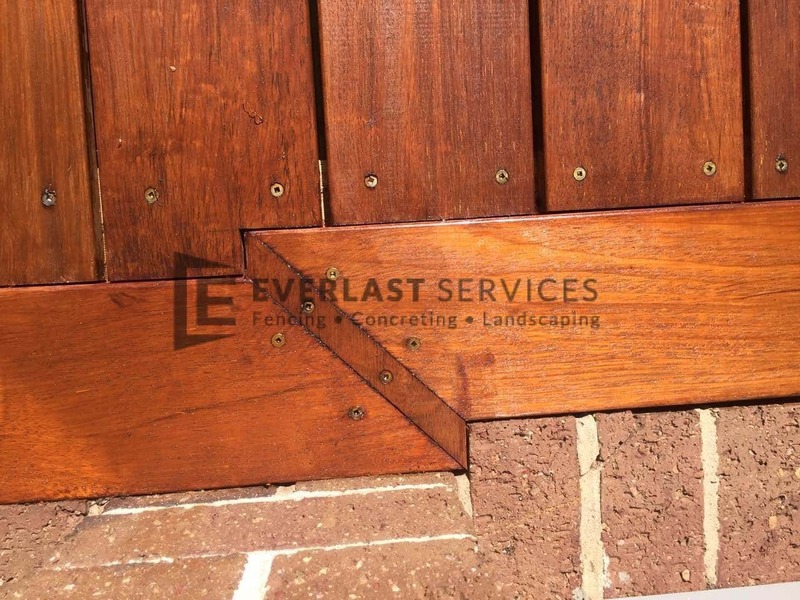 The Everlast Services team loves nothing more than having their skills tested and this project presented our carpenters with an opportunity to call upon their full array of talent. The end product is simply perfect. The deck had to but up against the brickwork at points and the team ensured that there was absolutely no gap and that the lines matched the lines of the brick perfectly. The storage units underneath the deck are completely invisible and they open and shut perfectly meaning the hinges will last forever. 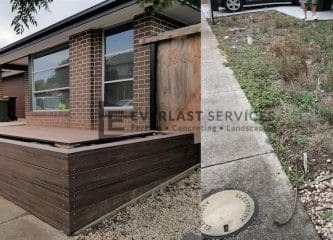 The planter boxes follow the same line as the rest of the deck and will look incredible when they are filled with the owner’s favourite plants. The team ensured that there are appropriate drainage points so that the wood won’t be affected by any pooling of water. 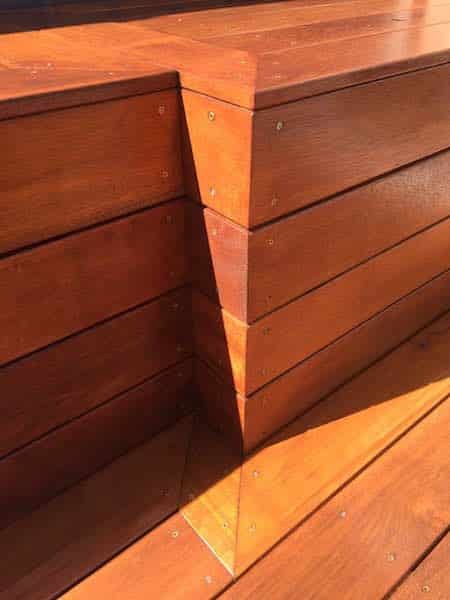 The lines throughout the decking are ruler straight and the team took extra care to ensure that every single piece of wood was the same thickness and width to achieve uniformity throughout the decked area. The shot of the corner shows how perfectly the lines run. The staining of the wood tops everything off and the contrast with the grass looks amazing. 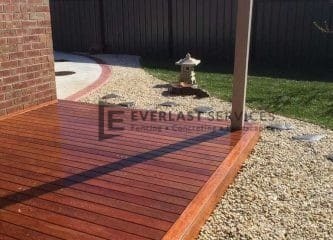 At Everlast Services we only use high-quality products and we were able to purchase high-quality materials at a far reduced price and pass these savings onto the customer. 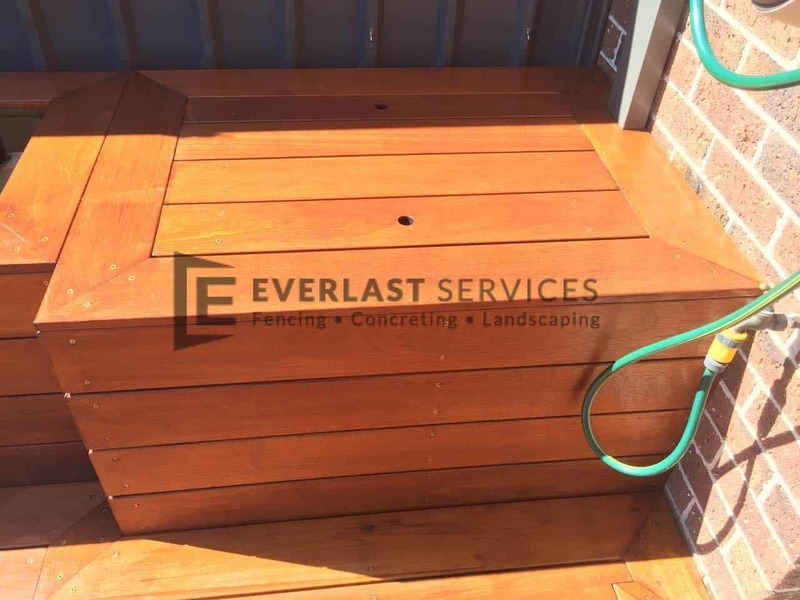 Using a high-quality stainer protects the wood and maintains the look of the deck for longer than cheaper options so we could pass on a promise to the customer that the decking would look as good as new for a long period of time. This is a project we are particularly proud of and the customer was amazed by the quality of our work, we delivered everything we promised and were able to do this for a far cheaper price than they expected.